on the beautiful Carnival Imagination departing Thursday, September 29th. ​How much fun can you have aboard the CARNIVAL IMAGINATION? More than you can imagine, including: a 9-hole mini golf course, Carnival WaterWorks water park, a tropical resort-style pool and Serenity-Adult only Retreat. And, that's on top of the delicious dining options, onboard activities, nightlife, casino games and relaxing spa treatments that have been part of CARNIVAL IMAGINATION all along. 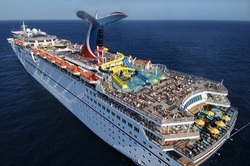 Every cabin booked gets a $25 onboard credit in addition to any sales that Carnival is having at that time. The deposit would be $100 per person due to secure your cabin. Rates will expire May 1, 2016 and the balance due by July 31st, 2016. Other categories are available upon request. The pricing is based on everyone in the groups' cabins being close together. If the current sale price through Carnival is less, you will get the lower pricing. • Cancellations made on or after 7/31/16 will be assessed appropriate cancellation penalties.